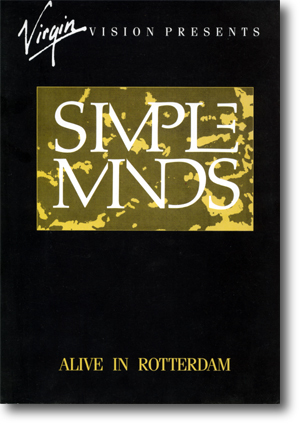 The Tube (the coolest UK music show in the early to mid 1980s) wanted footage of Simple Minds on tour and so dispatched their own crew to film the band at The Ahoy, Rotterdam. Virgin also wanted a video of the band, so co-financed the venture. The audio was mixed by New Gold Dream (81,82,83,84) producer Peter Walsh. With a teaser of Alive And Kicking featured on one show, The Tube got their important exclusive and featured Simple Minds on their next broadcast, just in time for the UK leg of the tour. Virgin also had an option on the footage and prepared an hour long concert film, which was distributed through Virgin Vision. Titled Alive In Rotterdam , the video featured eight tracks from the gig. The film was offered to music shows and other TV broadcasters, who often showed it during late-night rock-show slots. Virgin Vision also prepared a colour card flyer which summarised the video's contents (and is shown here). A shorter 45 minute version of the video was also distributed. Unfortunately, probably due to the complications arising from two production companies being involved, Alive In Rotterdam has never been released commercially. A Tyne Tees / Virgin Atlantic co-production. VHS video with typed spine label in blank silver sleeve. Original promo copies are extremely rare. 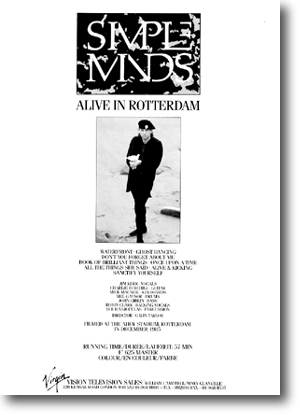 The video includes on-screen counter and countdown timer whilst the video cassette is blank apart from a Simple Minds - Live In Rotterdam spine sticker.